AUSTRALIA’S wool production is forecast to fall below 300 million kilograms for the first time in more than 90 years in 2019 and to continue to fall next season. The Australian Wool Production Forecasting Committee has forecast that Australian shorn wool production for 2018/19 will be 298 mkgs greasy. This is a 12.7 percent decline from the levels in 2017/18 and reflects the continuing drought conditions across large parts of Australia, the committee said last week. According to ABS figures, Australia’s wool production fell to 267 mkgs in 1924, before lifting to 330 mkgs the next year. Australian wool production is dropping to levels of the early 1900s. Source: ABS. The committee’s first forecast for 2019/20 is for shorn wool production to be 285 mkgs greasy, a further fall of 4.5pc, due to a reduction in the number of sheep expected to be shorn. This early forecast assumes normal seasonal conditions in 2019/20, the committee said. But it has acknowledged the impact of the drought will continue into the new season due, in part, to reported low scanning and lambing percentages in 2018/19. The committee’s revised 2018/19 forecast is 10.8pc lower than its previous estimate of 305 mkg, made at its November 2018 meeting. Committee chairman, Russell Pattinson said ongoing drought conditions across large parts of Australia have further decreased Australian wool production. “Adult sheep numbers continued to decline during the 2018/19 season. Mr Pattinson said along with a reduction in greasy wool production, there have also been significant changes in key test parameters, a further reflection of ongoing dry conditions. Average yield, which currently stands at 63.8pc is at its lowest level in eight seasons and the mean fibre diameter of the national clip is 0.5 microns finer than at the same time last season. “There have also been considerable reductions in staple length, staple strength and vegetable matter. “The committee noted that the AWTA test data to March 2019 showed a significant increase in the weight of wool tested of 17.5 microns and finer, as well as a decline in the volume of 18.6 to 24.5 microns wool and 26.6 and broader,” Mr Pattinson said. Mr Pattinson said welcome rain has fallen across several key wool producing areas around the country during the last week of March, but the committee recognised follow-up falls will be necessary. Wool producers recognise the value of their breeding ewes and are intending to hold them where possible, the committee said. 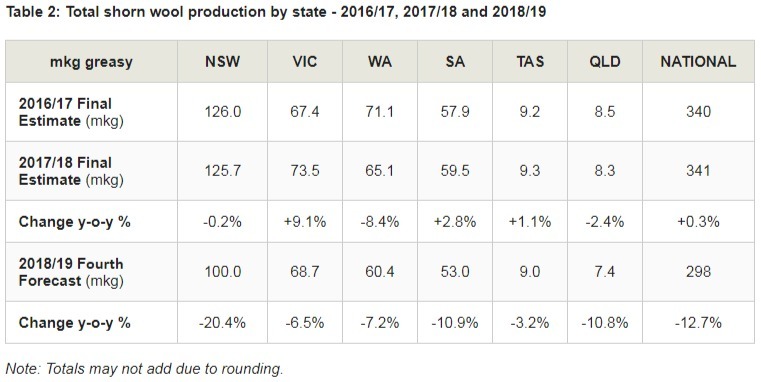 Consistent with Australia’s pastoral areas being the hardest hit by recent drought and flood conditions, New South Wales is expected to suffer the largest percentage drop in wool production in 2018/19, down 20.4pc, followed by South Australia 9-10.9pc), Queensland (- 10.8pc), Western Australia (-7.2pc), Victoria (-6.5pc) and Tasmania (-3.2pc). The wool market is very nervous, this problem doesn’t help constant business development and stability in the customers, as the prices in the last year have increased dramatically and the designers began to search for other options.